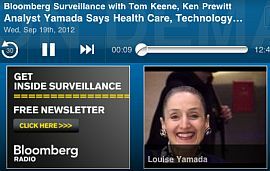 September 19, 2012: Describing her as "one of the 4 or 5 most popular guests of the show," Tom Keene, together with Ken Prewitt, interviews Louise on Bloomberg Radio's Bloomberg Surveillance. Topics include the major equity indexes ("NASDAQ is in a structural bull market"), the prices of gold and oil, how to draw trend lines, the best-looking S&P 500 sectors, and the fact that several DJIA members have long bases. September 18, 2012: Introduced by host Melissa Lee as "one of the most respected analysts on Wall Street," Louise discusses market conditions on CNBC TV's Fast Money. Topics include the S&P 500 index, and the prices of oil and gold. September 4, 2012: Louise discusses current market technicals with host Betty Liu on Bloomberg Radio's "In the Loop, At the Half." Topics include September; support and resistance levels; equity trading volume; the Euro; and the prices of oil and gold. September 2, 2012: Louise is interviewed by Ambrose Evans-Pritchard, International Business Editor of the UK newspaper Daily Telegraph about the technical condition of the market. The article bears the following subhead: "Louise Yamada clinched her reputation as America's oracle of technical analysis with an emphatic sell warning at the top of the Wall Street boom in 2007." February 29, 2012: Making a Leap Year Day appearance on Bloomberg Radio's "Surveillance", Louise is interviewed by Tom Keene and Ken Prewitt about the continuing up-move in the financial markets, particularly NASDAQ; the price of gold; how technical analysis can help identify market tops; and some currently under-performing sectors. February 21, 2012: ABC's of Reading Stock Charts. Louise is interviewed by Jeff Macke on "Breakout" at Yahoo Finance. 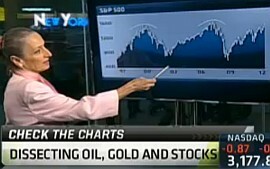 February 16, 2012: In an interview on finance.yahoo.com, Louise talks with "Breakout" host Jeff Macke about the price of gold and of Brent Crude Oil. All declines are not equal: Louise points out that the price of gold stayed above its 2008 trend line all during last year's twenty percent decline. February 15, 2012: Interviewed by Jeff Macke on Yahoo Finance's "Breakout," Louise discusses the NASDAQ Index which has just broken out into a structural bull market. As for the Dow Jones Industrial Average and the S&P 500, although these two indexes have outperformed most of the world markets over the past year, they are currently facing overhead resistance of their 2007-2008 highs. February 8, 2012: In an extended interview with Sara Eisen on Bloomberg Radio's "On the Economy", Louise discusses the cyclical bull advance in global stock markets; the new structural bull market in the NASDAQ-100 Index; the Financial and Consumer Discretionary S&P 500 sectors; commodities (including gold, silver, copper and crude oil); the price trading range for the Euro; the U.S. dollar/yen price relationship; and interest rates (including a basing process possibly underway in the 30-year U.S. Treasury). Last Updated: January 7, 2016 10 PM Copyright 2005-2019. All Rights Reserved.